Staging the foyer will help you make that all important great first impression to buyers as they walk through your door. If potential buyers like what they see in the front entry, they'll be excited to see the rest of your home! Staging the foyer is that necessary step that needs to be made to lure buyers into the rest of your home. If buyers are tripping over a flotsam and jetsam of shoes in the front entry, they'll assume that the rest of the house is just as disorganized and lacking in storage. Your foyer doesn’t have to be grand to impress buyers. A modest front entry can look just as welcoming if it is organized, warm and inviting. If you ascribe to feng shui interior home design, you already know that the foyer is one of the most important rooms in your house. According to the principles of feng shui, you must create a positive landing place for energy inside the main entry. The main entry needs to welcome and direct the flow of energy into the house, rather than push it away or weaken it. Changing paint colors is one of the easiest (and cheapest!) ways to update your entire home. The trick is to select paint colors for your foyer that relate and flow from room to room. Bold, bright or dark paint colors will likely turn many buyers away, because they'll be thinking about all the repainting they'll have to do. Worse yet is the discovery of outdated wallpaper as buyers first walk in the door! Limit your interior colors for home staging to earth tones and neutrals, or warm shades of white. Neutral interior colors for home staging include black and white, all the grays in between, beige, taupe and earth tones. Neutral colors are the easiest to decorate with because they blend well with most surroundings and work successfully in all interior home design. Plus, neutrals appeal to both sexes. Light neutrals and earth tones have the widest appeal among home buyers and will complement most people’s furniture. Neutral wall tones create excellent backdrops for the color you are going to add later during the final staging, with artwork and accessories. Added color will simply "pop" against a neutral canvas. If you're lucky, your front entry will already have a great focal point, like a stunning chandelier or a grand staircase that'll draw buyers in. If so, stage the foyer to highlight the focal point. 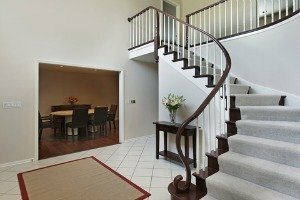 In the photo above, the staircase is instantly recognized as the focal point in this room. The foyer is a bit stark, with the white walls and tile. The cold tile floor has been warmed up with an area rug, and the console fills a empty space on the wall. A warm neutral wall color would make this front entry more inviting. The fresh flowers liven up the space, but I would prefer to see a larger floral arrangement with more color! Perhaps a bit or orange to compliment the area rug border. Architectural elements like; a staircase, ceilings with tray or cove details, box beams or a beautiful window. You may have to create your own focal point in the foyer. Use an unusual piece of furniture for a focal point, like an antique bedroom dresser, or console with drawers against a wall. Hang a large mirror or painting above it, and place a lamp on top. 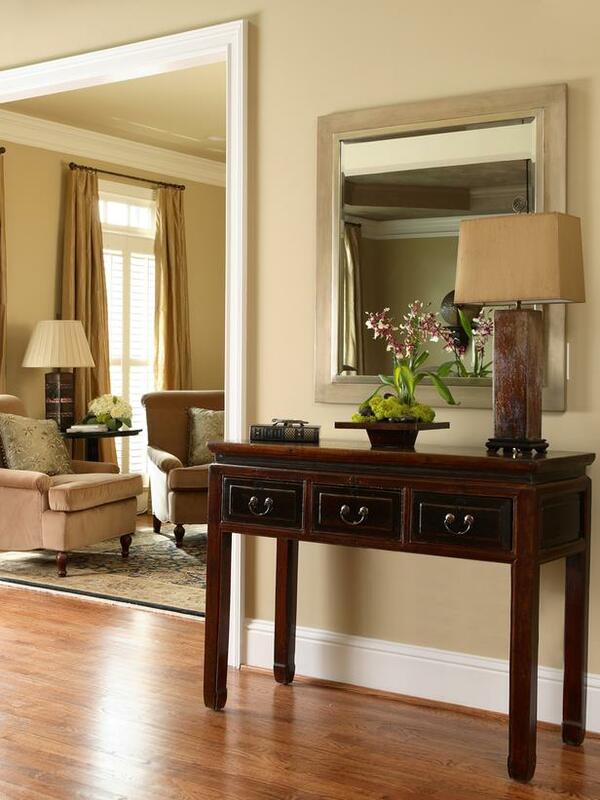 For a small foyer, use a mirror(s) to visually expand the space and bounce light around. If your foyer is a narrow passageway with absolutely no room for furniture, mount a shelf on the wall (not deeper than 5-6” so people don’t bang their shoulders against it). 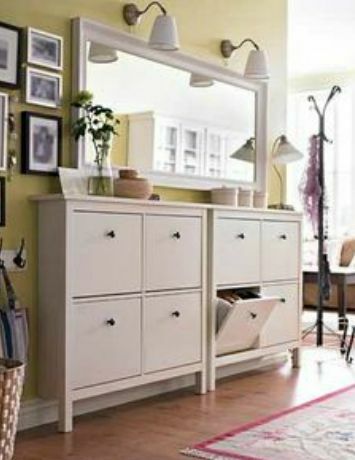 Place a mirror above it to visually widen the passageway. Keep accessories on foyer shelves very simple. For a large empty wall that is begging to be accessorized, hang a tapestry, mirror or large piece of art. A large area rug or runner can add color, warmth and texture to your entry. A patterned rug will hide tracked-in dirt. Don’t put down an assortment of small rugs-- this will look cluttered. Group assorted potted plants that compliment each other on a table, (no more than 3) or a tall leafy plant on the floor. Make sure that people aren't brushing against leafy plants as they walk by. 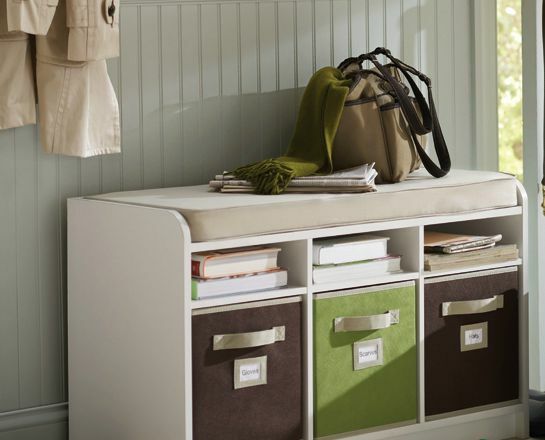 Create a vignette with baskets or bowls, (for keys or mail) flowers, collections, vases, etc. Use odd numbers and staggered heights when creating a vignette as in the photo on the right. 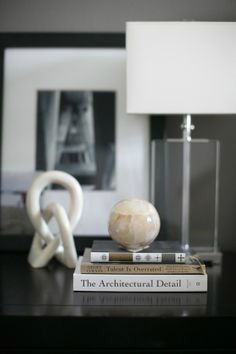 See art of accessorizing for more home design ideas. If you don't have a foyer, that is, if you walk straight into a living room or kitchen, try to create some kind of divider that will give the impression of a foyer. Most people are uncomfortable walking directly into a room without an entry. There's always the question of where to put your shoes and coat. 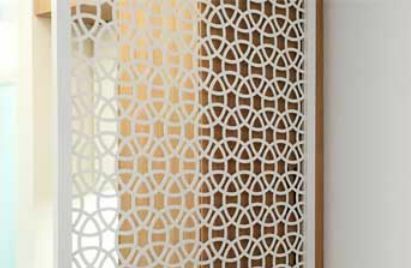 A divider, or screen doesn't necessarily have to block the room, just give the feeling of two separate spaces. fill a rectangular planter with foam blocks and stick bamboo poles or tall grasses, like pampas grass, into the foam. This'll create a filtered screen.